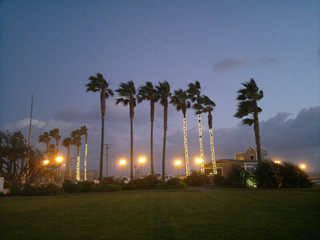 Posted February 13th, 2012 by Ms. Jen & filed under oh, california, photos + text from the road. 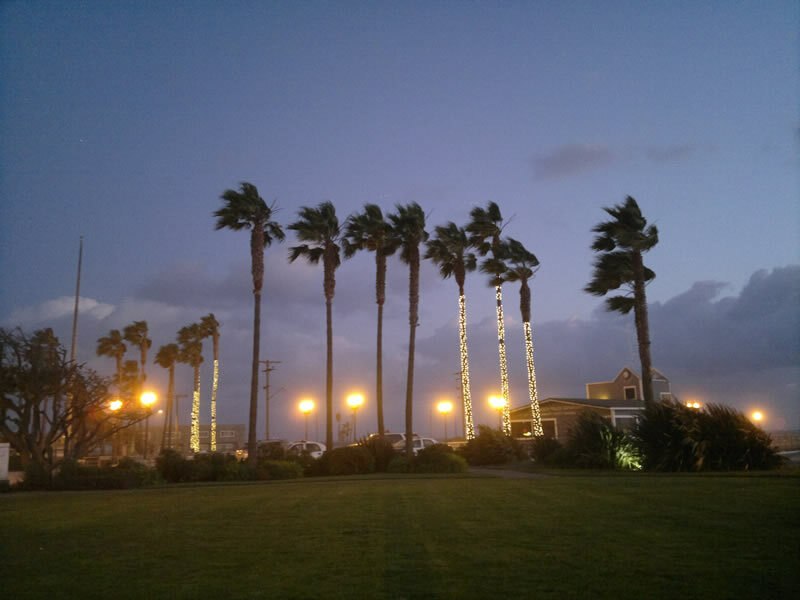 Mon 02.13.12 – Early this evening when Scruffy and I went out for our walk it was about 57F and a good wind was blowing off the ocean, as we rounded the corner towards the Seal Beach Pier, I could see sand blowing across the road and palm trees bending in the wind. We had to turn around about 2/3rds of the way through our normal walk as the blowing sand was irritating our eyes and making me cough. It looked lovely though, in a strange dry misty way. 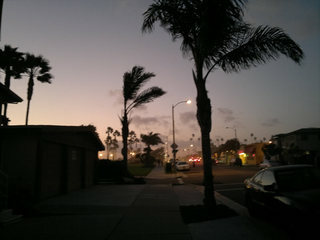 Posted April 3rd, 2011 by Ms. Jen & filed under art + photography, oh, california. Posted February 5th, 2011 by Ms. Jen & filed under moleskine to mobile, oh, california. Sat 02.05.11 – This week has been eventful from the server surprise on Tuesday to Grandma Grace’s pre-91st birthday party today. The best part of the week was all the local fruit trees decided to be in full-bloom just in time for lunar New Year and St. Brigid’s Day. This evening as Scruffy and I went out for his last walk of the evening, I decided to try out the night mode on my Nokia N8 to see how photos of the blossoms would turn out in the dark with only a street light for illumination. 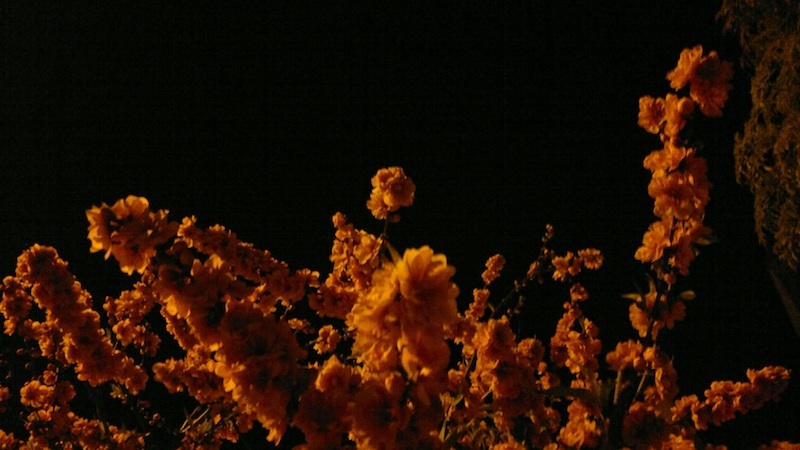 The blossoms were lovely in the dark with the yellow of the street light shining down. Posted August 17th, 2010 by Ms. Jen & filed under art + photography, moleskine to mobile. Recently I found myself thinking about camera phone apps, more specifically about Hipstamatic and do folks really use it past the week they bought it out of the App Store? Amongst the photographers and designers I know and follow on Flickr, I will occasionally see a photo that looks like it was Hipstamatic-d but not often, which makes me to wonder if it is due to the fact that Hipstamatic does not make a back up of the original photo before it is processed or if folks just aren’t interested in Lomo like mobile camera phone photos. My curiosity continued to wander and I started to wonder really how many camera phone apps people were using past the first week of buying them. Furthermore, what iPhone and Android camera phone apps were people buying and using with any regularity. Do folks like the ‘toy camera’ apps or were they using camera apps with other functionality? The Camera phone app world has quite exploded on the iPhone and Android is catching up, but when I searched the Ovi Store there were very few camera phone apps for Symbian devices and those that were there were more geared to an East Asian J-Pop photo booth cute overload on neon aesthetic than the Graham Parson-esque Silver Like circa 1972 via a yellow daisy filled green meadow in misty sunlight aesthetic of Hipstamatic. There was one Symbian app, Joyeye, that promised Lomo style photos, but it did not work on my Nokia N86 and I did not try to download a version for the N97. It may be that it is only for touchscreen Symbian devices or it may be that the Ovi Store seems dead set on thinking my N86 is an N97. msjen: iPhone folk, what is your favorite camera or photo app & why? Posted August 12th, 2010 by Ms. Jen & filed under art + photography, moleskine to mobile, photos + text from the road. Happy Day. I received an email today saying that Sports Tracker is back and ready to be downloaded. Sports Tracker has been on hiatus the last year or so, after it was spun off as a beta software product at Nokia to become its own company. The nice folk behind Sports Tracker have updated the website, ported over all of the data from folks’ accounts at Nokia’s Sports Tracker server, and have created mobile apps for all the current Nokia phones with GPS on board. I am quite excited as I have missed Sports Tracker on my Nokia N86. I have missed mapping my route as Scruffy and I walk each day and I take photos. It is good fun to have a record both in terms of a map and a data record of how fast or slow one walked, the altitude and other fun geo-athletic details. Sports Tracker ported about 95% of my ‘routes’ to the new server, only leaving out all routes before the Chennai photowalk, of which those previous routes were when Sports Tracker was in beta and I was testing SP before departing for the Urbanista Trip to India. My only two minor objections to the new Sports Tracker is that the new website is in Flash and the mobile app I downloaded from the Ovi Store for my Nokia N86 doesn’t have an obvious way for me to log into the new Sports Tracker website to pair my routes with the site. Hopefully, the mobile app will ask me to pair the mobile to the server when I start my first ‘workout’. I look forward to seeing what the Sports Tracker team will do and am excited that I can now pair my photos with a mapped route of my photo walks again. Thanks, Sports Tracker! 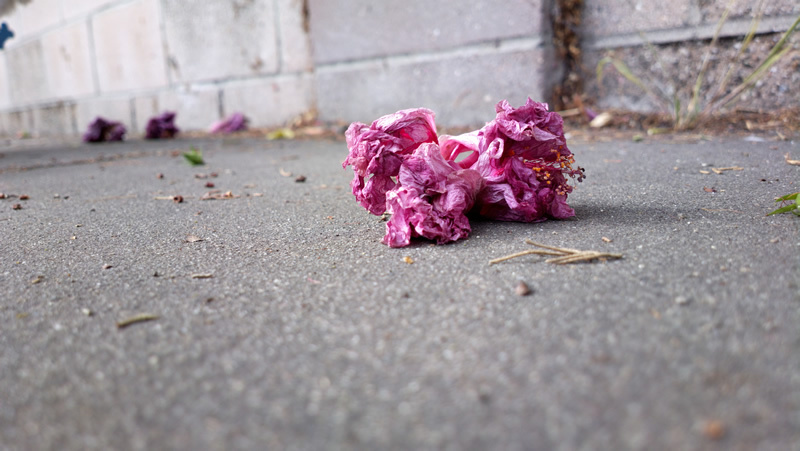 Posted July 24th, 2010 by Ms. Jen & filed under art + photography, fun stuff. Sat 07.24.10 – At Traci’s sister Kristin’s baby shower. More photos when I am less tired. Posted July 19th, 2010 by Ms. Jen & filed under art + photography, moleskine to mobile. To follow up on last week’s post, 2,045 Days with a Camera Phone, I would like to write a bit more on why I have loved camera phone photography and mobile blogging so much in the last 5.5 years and that can be summed up in one word: constraints. The old adage in design, photography, and many other arts is that it is not unlimited creative freedom that sparks the best in a designer or artist, but it is limits and constraints that the artist or designer has to push at, be challenged by, and get around that create great art and design or at least cause the artist in question to grow in their craft. It has been very easy the last 8-10 years to hone one’s craft with a DSLR camera almost to the point where too many photographers get obsessed with megapixels, lenses, and processing in Photoshop than the actual act of taking the photo becomes secondary or farther down the line. By choosing to shoot more than 90% of my photos of the last half decade with a small camera phone and then choosing to send them directly from the phone to the internet with no stops at Photoshop, means that I purposefully chose to constrain myself to a small camera that in many cases had less megapixels and less of a lens & digital sensor system than the contemporary point & shoots, not even considering what the comparable time period of DSLRs could do. But the magic of setting the self-imposed discipline of the constraints of a camera phone plus no or very little post-phone processing seriously, meant that I had to really hone my eye, my composition, my observation of the scene, and then just shoot and shoot and shoot. I have shot a lot of bad photos in the last 5+ years, but I have also shot a lot of good to wonderful photos with my camera phones. And it is the discipline of the constraints of a camera phone that make the great photos all the more sweeter than when I shoot a good photo with a Nikon film SLR or DSLR. All of that being said, I have some to quite a bit of trepidation about the next generation of camera phones, particularly the Nokia N8, as it really is better than the point & shoots out on the market right now. The photos from its big 12 megapixel digital sensor & Zeiss lens are extraordinarily good. After 5.5 years of pushing, working around, thinking, changing the angle, doing whatever I could to capture the vision in my head with a camera phone, to have a camera phone that will be not just good enough, but great… …that is why I said in the last article that I started to think seriously about film rangefinders or purchasing a high end Nikon. 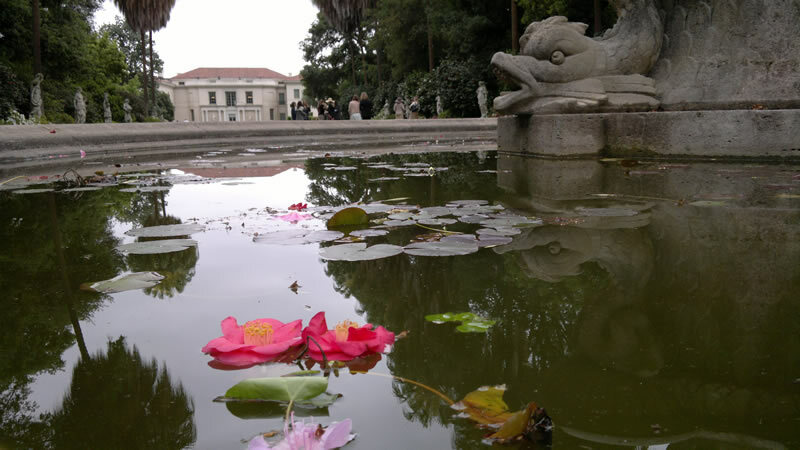 My thoughts were – if the Nokia N8 is so spectacular then I won’t have much in the way of constraints, then whole rubric for why I have shot with camera phones since 2004 will be over. Yes, as I said in 2,045 Days with a Camera Phone, the Nokia N8 is the arrival of the maturity of camera phones as a photographing instrument and the pioneering era is mostly over, particularly if one was shooting with camera phones from the perspective of constraints or enjoying the toy quality of some camera phone’s imagery. But I am not going to run away. Why? Because I trust Damian. I trust Mr. Dinning’s vision that he has had the last 6 years to push the technology of camera phones to meet that of the highest quality levels. He and I had several interesting conversations over meals at the big adventure in May that gave me an insight to his desire to make the Nokia Nseries line of cameras cross from good to great. Damian and his team have not failed me in the Nokia N86 or any other Nseries camera phones that I have taken photos with since 2004. So, I will let go of my imposed constraints and walk into a new era and see how good camera phones can really get for the photographer who wants a camera on one at all times, with the N8 I will just have to find a few new challenges to set for myself.